When you see the videos from the Volvo Ocean Race boats bashing through big waves at 25kts, the alarming thing to me is the blasting of water that often hits the exposed driver, not to mention anyone else who happens to be on deck. Not that we expect to be that extreme, but this should be a relatively fast boat and there will be days of choppy water and cold temps. Simply put, we need a good windshield. This project is a custom job (not in the designer’s plans). I’m making it in removable sections so we keep the trucking height down, and have options for a more open air cockpit here in SF bay. 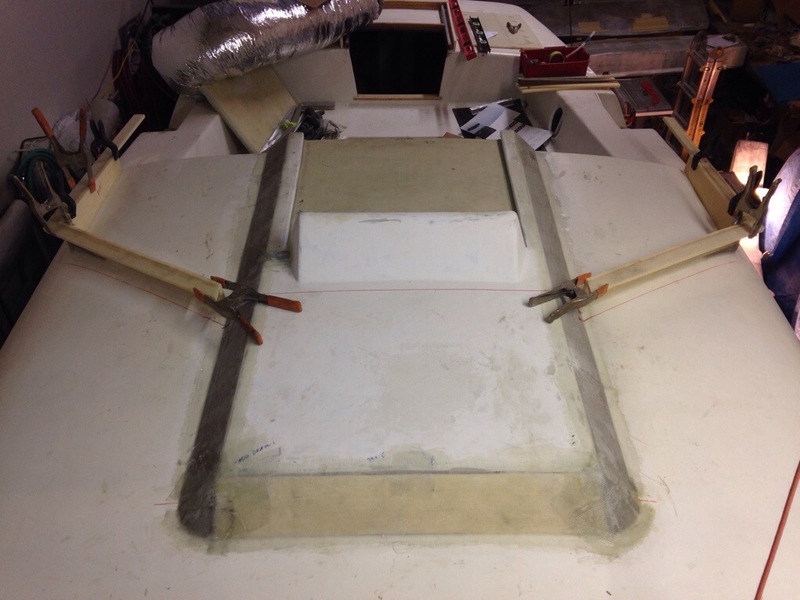 Here’s the first step, laying out three big forward windows via base framing. Tomorrow we’ll fill in the big gap from these new frames down to the sloping-away coaming, and start on the forward edge of the frame. 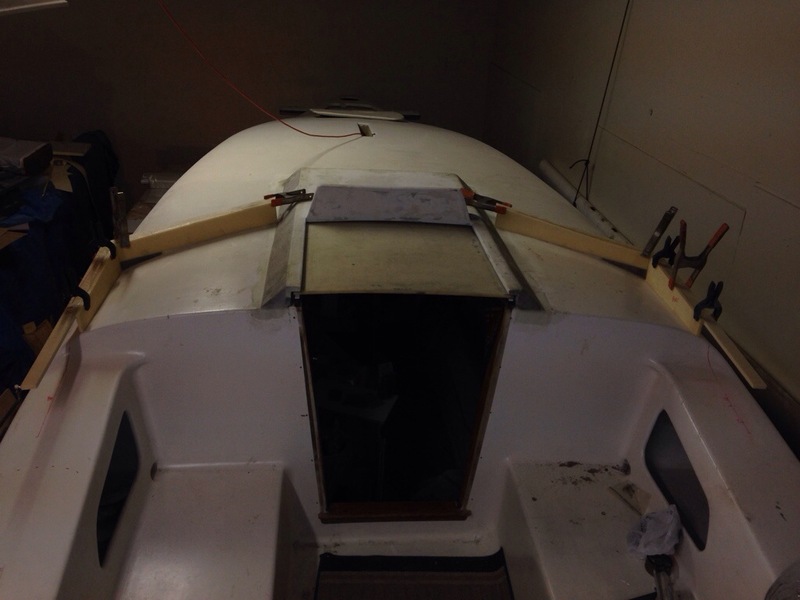 Building it right on the boat seemed faster then mocking it all up on the workbench with repeated up and downs. Meanwhile, the beam bottom sides were finished and Sunday afternoon Griffin helped me get two of them up in position for fairing the tops. 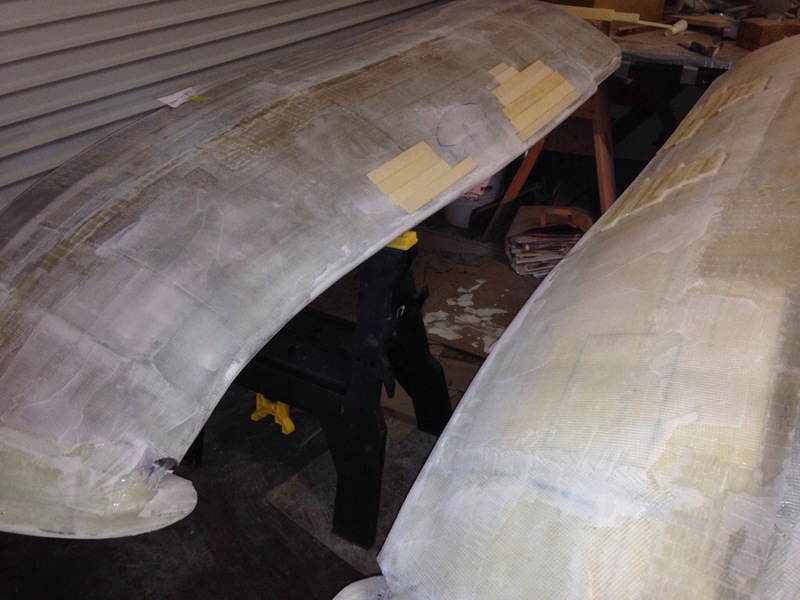 Unfortunately it looks like the wave-deflector framing mold had about a quarter inch miss in two of the nine forms. That showed up today as shallow depressions on the front slopes of the finished beams. So we’ll have a few ounces of wasted weight added with some extra foam and another light glass layer over the fill-in areas. And of course chalk up another couple of hours in the re-do column. (Keep the saw exactly on line next time).